I could not put this book down! I read it in one night! To be fair, it’s about 180 pages so it wasn’t a huge feat but it was too good to quit reading so I just finished it! It has such a good story about faith and hope and how everyone can struggle with asking God “Why?” – even pastors. This is a true story so I’m not going to do a spoiler section. I’m just going to summarize the book vaguely but PLEASE go read it! The basic storyline is about a 4 year old boy who gets very sick and has to have surgery. His father is a pastor at a church and struggles with wondering why God would be putting his family through this trial among other problems that the family has recently experienced. His son makes it out of surgery and eventually gets better. Soon after his surgery, he begins to talk about Jesus and Heaven as if he was there. He is insistent about details such as Jesus’ clothes and who he met and how long he was there. He also begins talking about people or subjects that he would have no way of knowing about. The story is a heartwarming, family-friendly story about what faith really means to a family and how having faith can change everything. 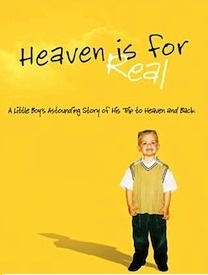 Our definition of faith is commonly believing something can happen because God wants it to, but this story pushes us to believe in something unexplainable: a boy can go to heaven and come back to tell us about it. I recommend this book to everyone and anyone.